Bridal arches are very popular for indoor as well as outdoor weddings. You can decorate it yourself with the help of family and friends. Let's take a look at some options for decorating arches for a wedding. 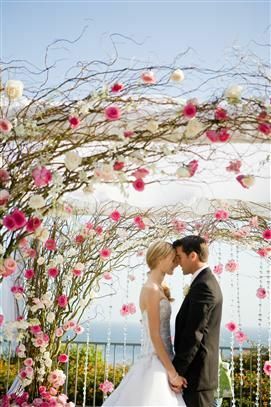 There is something so romantic about having your wedding ceremony under a beautifully decorated arch. Wedding arches, decorated the right way, can look charming and elegant. Most people think that wedding arches are suitable only for an outdoor wedding. 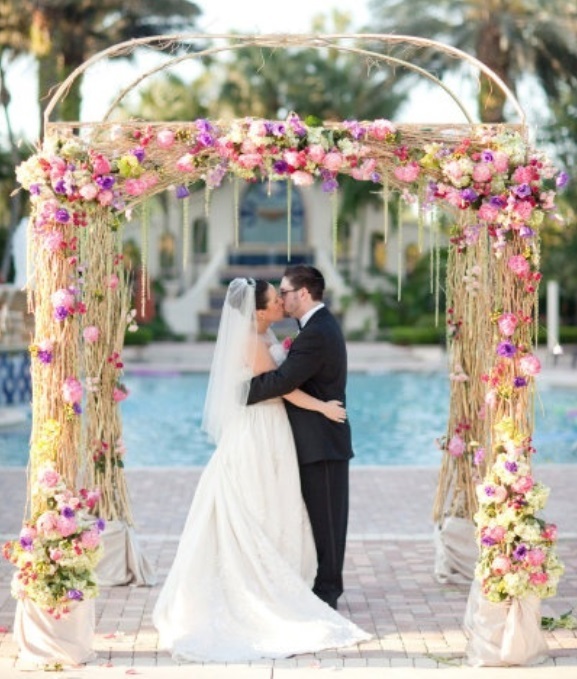 But these arches can also be incorporated in an indoor wedding ceremony or reception. Flowers are one of the most commonly used item for decorating an arch. However, you can also use branches, balloons, pinwheels, tulle, streamers, strings of twinkling, fairy lights and crystals for decorating an arch. 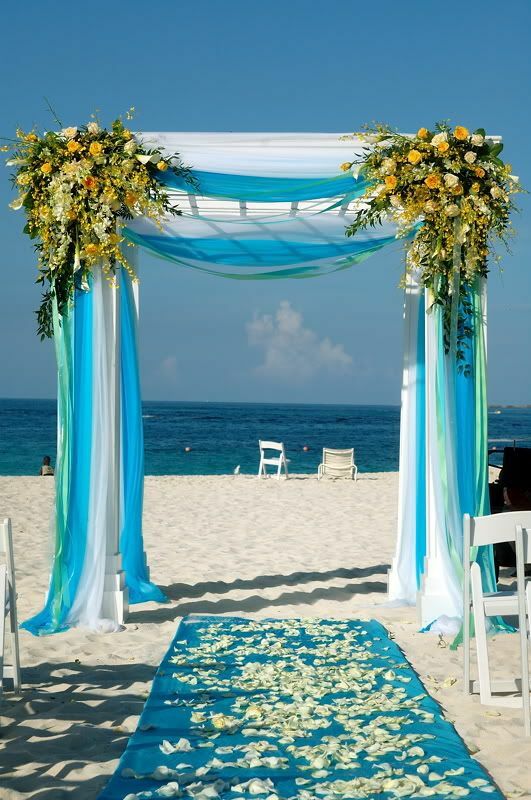 Here we will take a look at some of the ways in which you can decorate a wedding arch. Using just fresh flowers for decorating bridal arches can turn out to be very expensive. Additionally, some flowers are quite delicate and will wilt in hot weather. So, a good idea is to decorate it with fabrics like tulle and organza. Floaty fabrics like tulle and organza are ideal for using in wedding decorations as they give a soft, romantic look. You can also use shimmery chiffon or lace to adorn the arch. 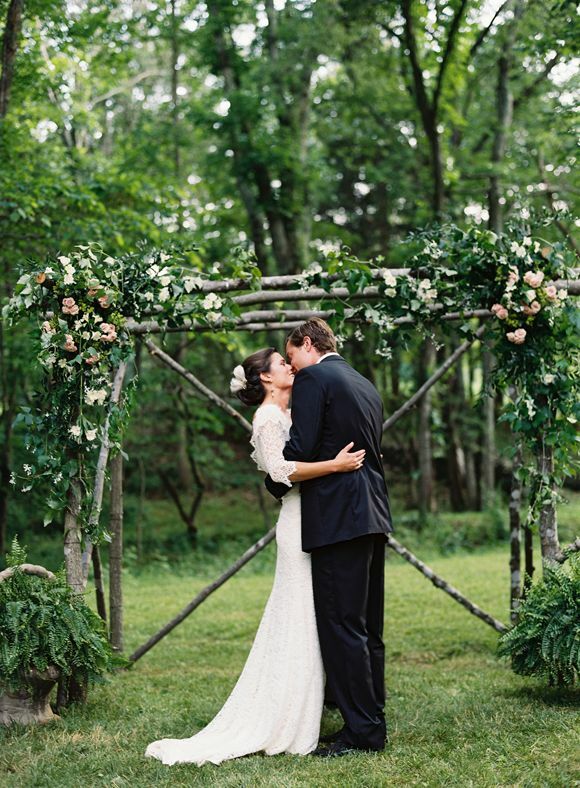 To keep the bridal arch from looking too stark, add a few fresh or silk flowers. Flowers are perhaps the most popular choice for decorating bridal arches. You can choose traditional wedding flowers like roses, lilies, ranunculus, chrysanthemums, daisies, anemones, dahlias and peonies. Or you can opt for exotic flowers like birds of paradise, parrot tulips, lily of the valley and cymbidium orchids. However, keep in mind that these exotic flowers will cost a lot more than roses or ranunculus. If you have a white themed wedding ceremony, then a great idea is to choose white anthurium flowers for decorating the wedding arch. Remember, not to skimp on the flowers, or the arch would look bare and shabby. If you are on a budget, then you can create a bridal arch with the help of leaves and a few seasonal flowers. 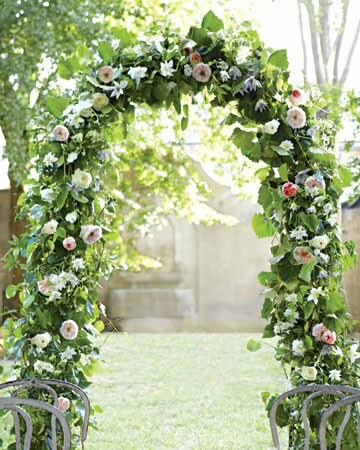 With the help of wire or floral netting, cover the bridal arch completely with green leaves to achieve the perfect look. Add a few inexpensive seasonal flowers to give this leafy arch a more refined look. If you are apprehensive that the flowers will not stay fresh for long, you can use dried or silk flowers and faux ivy instead. If you are looking to create an ethereal and romantic vibe, then your wedding decoration should reflect that. A great idea is to loosely drape the bridal arch with gauzy material, and attach a few paper butterflies. You can also use seashells and starfish instead of butterflies. For a Hawaiian theme, palm tree fronds and tulle with tropical flowers like lilies and heliconias are perfect for your bridal arch. 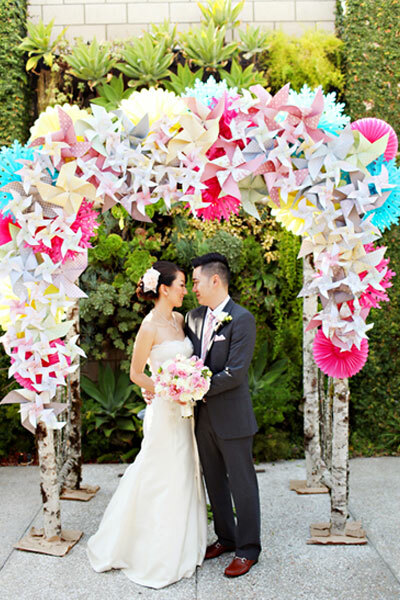 For a playful look, you can decorate the wedding arch with pinwheels and honeycomb garlands. There are many ways of decorating wedding arches. Just remember to be resourceful and innovative, and don't forget to personalize your wedding decorations.